Alice in Chains are one of those bands whose longevity is undeniable and whose influence is vast. They have withstood the test of time and have gone through some of the hardest moments a band can meet. Still, they have battled through and steamrolled ahead. Their latest release, The Devil Put Dinosaurs Here, is a true testament to what the band is all about. 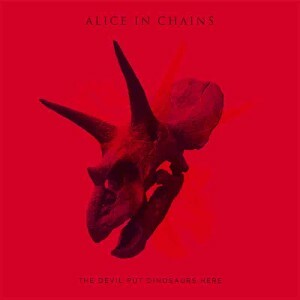 Kicking it off with “Hollow,” it’s clear Alice in Chains have moved to a more duel-lead vocals with William DuVall splitting time with founder Jerry Cantrell in perfect 50/50 balance. The Devil Put Dinosaurs Here features that classic psychedelic Alice in Chains sound but is a little bit slower than some of their previous work. If Black Gives Way to Blue could have gone to the next level, The Devil Put Dinosaurs Here is that album. Alice in Chains have taken what was already an impressive career and added yet another great album to the mix. This one is right up there with the best Alice in Chains albums of all time.